Tamil Nadu has earned a distinctive name for itself because of its temples. Hence the idea of visiting a mosque in Tamil Nadu does not sound very exciting. However there are a few mosques in the state capital Chennai which are well worth as visit. The Big Mosque in Chennai is one of them. 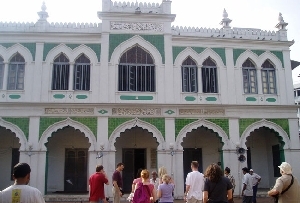 The Big Mosque, Chennai is also referred to as the Wallajah Mosque because it was built by Nawab Muhammad Ali Walajah who was the Nawab of Carnatic during the period 1749-1795 A.D. The Big Mosque is set in the midst of a large ground. The ground is the venue of religious and cultural activities. In fact, each year, under the able organization of the Meelad Committee, the Prophet’s birthday is celebrated in the grounds of this Mosque. The tombs of several eminent personalities lie adjacent to the Big Mosque in Chennai . They include the tombs of the Nawabs of Carnatic, the princes of Arcot, saints like Maulana Abdul Ali Bahrul Uloom and numerous other distinguished scholars and theologians. Any visitor will surely be impressed by the symmetrical proportions of the Big Mosque. This commanding structure is an incredible manifestation of superlative architectural skills. It has four minarets but there are no domes. However the most striking feature of the Big Mosque, Chennai is noticeable on the western walls of the mosque. It contains a stone inscription written by Raja Makhan Lal “Khirad”. One might be wondering as to what is so special about a stone inscription. Raja Makhan Lal was a Persian and Arabic scholar of exceptional caliber and merit and held the post of Private Secretary to the Nawab. But he was a Hindu. In no other mosque in the whole world will one find an inscription that has been composed by a non-Muslim. The Big Mosque in Chennai thus reflects the true spirit of secularism that has given the Indian nation a place of pride in the world. A large number of people gather in this historic Big Mosque to say their prayers during Ramzan or any other Muslim festival. Neither steel nor wood has been used in the construction of this structure that is a must see on your tour to Chennai. You are sure to be impressed by this superb grey granite edifice especially if you witness it in the light of dusk. The memory of this wonderful sight will linger for long in your minds.